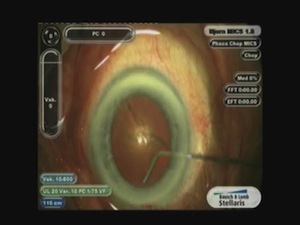 David F. Chang, MD, performs a cataract case with the Micro-Implantation Cataract Suite (Abbott) which enables the surgeon to perform an entire micro-surgical procedure. Performing cataract surgery through a sub-2.2mm incision is believed to reduce surgically induced astigmatism, provide a safer intra-operative environment, and promote faster healing and visual recovery. you use an irriagting cystotme for rhexis w/o ovd?